Your behavior says more than your sales pitch ever could. You don’t need a study to tell you this. You don’t need to see an investigative news report about it. You know this because you’re a human being — and as a human being, you connect better with people who demonstrate caring and thoughtful behavior. No sales pitch is ever going to take the place of a genuine conversation. For the RESET team and the professionals we coach, this means spending time learning about the business and political issues that directly affect the industries we do business in. Learning this is how we understand what matters to our clients so we can have more thoughtful — and ultimately more helpful — conversations with them. So how do you do this? How do you learn about the business and political issues directly affecting your clients? You show up in unexpected places. You talk to people with job titles and backgrounds that you wouldn’t normally interact with. And you attend industry-related events. Believe it or not, this last one is something a lot of people DON’T do. I recently attended the National Association of College and University Business Offices (NACUBO) 2018 Conference. Comedian W. Kamau Bell gave an insightful speech about education in America, and the sessions I attended from higher-education leaders were even more insightful. It was fascinating to learn about the business and political issues impacting our education. But I kept getting the same question from the owners and CEOs in attendance: Why are you here? The short answer I gave them was that I was just trying to learn what they were going through. And that answer seemed to resonate, because it frequently led to further discussion around what my firm does and why it might matter to them. I attended not to network or collect swag, but to listen to the business and political issues, as well as the emotional matters that are affecting higher education nationwide. I heard their fears around diminishing funding coming from state and other sources. I heard their concerns about hitting a limit with increased tuition. I was there to listen to their stories of clumsy attempts to make the higher-educational experience more meaningful by connecting to businesses and big corporations. I learned that they’re trying to find new and different ways to partner with those businesses and corporations. So why did I go to this conference? Why was this important for me to do — and why do I coach our clients to go to conferences for their target industries? Because this is how we learn how we can help — and it demonstrates that we truly want to understand the issues our clients are facing. It demonstrates our awareness of what’s impacting their organizational mission, and that we care about problem-solving for them. It leaves an impression on your current customers and the prospective customers you are hoping to work with. Showing up like this naturally leads to further discussion of what your firm does and how you can help. As an executive and top leader in your own company, showing up at these events is important. It enhances your overall go-to-market activity. It enables you to listen to and understand your target customer’s perspective. 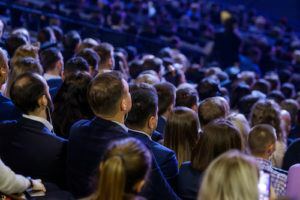 And finally, at these events you’ll pick up on the subtle messages that your customers don’t necessarily know how to verbalize, and that knowledge will add to the overall effectiveness of connecting with them. So get out from behind your desk. Break away from your own industry for a few days here and there, and immerse yourself in your customers’ industries. It’ll pay off in relationships and revenue. Wayne is the CEO of RESET, a public speaker, and author of the book RESET: What I Want You to Buy is...Stop Selling. After having spent twenty-five plus years in the project delivery industry with such companies as PSA/Dewberry, Bovis, and Gilbane Building Company, Wayne founded the firm and created The Connection Process to help bridge the communication gap between service providers and business executives. Wayne, by questioning, demonstrating, cajoling and pushing RESET clients, has developed a unique ability to crystallize concepts that ultimately help clients identify new ways to compete and grow.